Throwing axes in Whistler. It's like darts, but more Canadian. 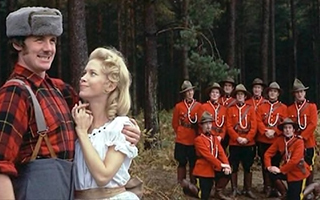 Canadian lumberjacks as depicted by the jealous dart-throwers of Monty Python. Throwing darts is OK for the English. It’s a sport that can be played with a pint in one hand -- and a big beer gut is not a disqualifier. But red-blooded Canadians are made of sterner stuff. We don’t throw poncey little darts. We are lumberjacks. We throw axes. And you don’t need a beard, a plaid flannel shirt and suspenders to celebrate our heritage at International Axe Throwing Day on 13JUN. You can simply go axe-throwing, an activity that has been gaining traction in Canada over the last several years. Forged Axe Throwing in Whistler, BC is one such locale where guests can grab a large bladed weapon, take aim and hurl it at a bullseye on a wooden board. Much like the more demure bowling or curling – or the aforementioned darts -- which also involve hurling something forward with aim, axe-throwing is a social activity. At Forged, guests can book 1-hour or 2.5-hour segments, or rent the entire facility, which can accommodate up to 110 people. 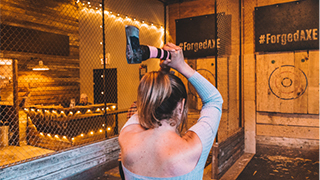 A resort like Whistler is known and enjoyed for its outdoors, but Forged says axe-throwing is an indoor activity that visitors can enjoy year-round. 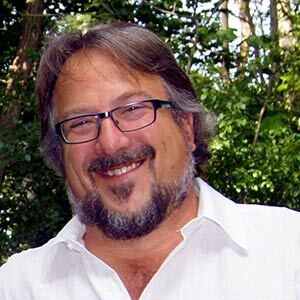 “Forged Axe Throwing is perfect for a Sunday-Funday, a rainy day, smokey fire day, or a get-out-of-the-cold activity,” they write on their website. Guests don’t need to be experienced sharp-object throwers to play. During their experience at Forged, a dedicated coach teaches them how to throw an axe and creates fun, competitive contests to challenge guests. A CBC article concedes that while it’s certainly not as big or popular as, say, basketball, axe throwing is a sport on the grow, with more and more leagues and tournaments surfacing. Enthusiasts hope to make axe-throwing an Olympic sport one day but until then, the most accurate lumberjacks (or lumberjanes) can win as much as $20,000 in cash prizes at tournaments. Toronto just hosted more than 1,000 contenders at the National Axe Throwing Federation Championship Finals — one of the biggest competitions to date.